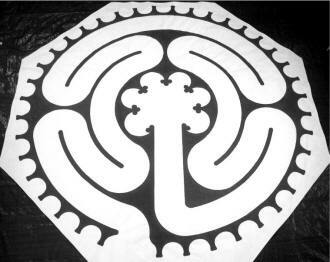 the ideal Chartres-type labyrinth for personal and ceremonial use. The name reflects both its three circuit design, and its application for sacred, intimate ceremony and personal use. Its smaller diameter (12 feet) allows its use in ceremonial, home and office settings where a larger labyrinth wouldn't be practical. The Trinity three circuit design has been used successfully in ceremonial and personal situations at churches, in prayer circles, ordinations, seminars, and retreats. It is especially useful in smaller spaces when use of a larger sized labyrinth isn't possible. The design retains several notable features found in the Chartres Labyrinth. In our years of facilitating full size Chartres labyrinth walks, walkers often mentioned one or more of these features as important to their personal labyrinth experience. The design includes 39 lunations/teeth around the perimeter, with what would be the 40th lunation represented by the entry way. The Number 40 has great significance in many sacred stories and practices. Including; the great flood, Christ's 40 days in the wilderness prior to beginning his ministry, Lent, Advent, etc. Walking the Trinity as part of a wedding or other ceremony brings the impact of the full size 11-circuit Chartres into the center of the ceremonial gathering with appropriate grace. As a personal tool, it offers a convenient small package that can fit most home settings. 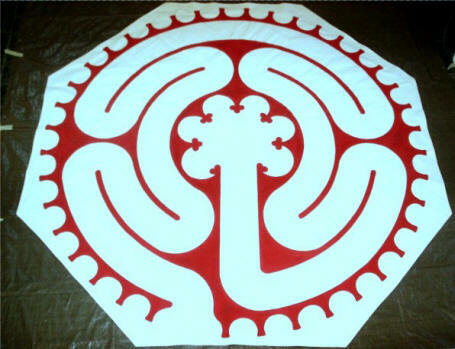 The The Trinity© Labyrinth is ideal in the size range of 12-15 feet. It can be created in quality 12-oz Canvas, colored poly-canvas or Durable wear-resistant fabric in your choice of line colors and diameters.